Feel free you add your photos to the Sound Mirrors Pool. 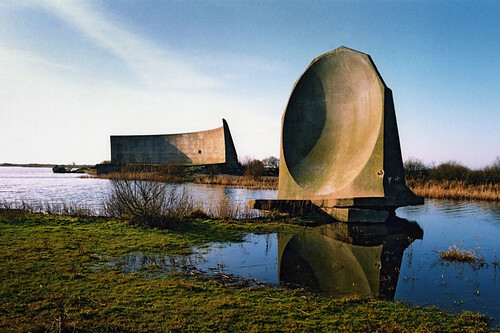 Some photos of the Hythe and Denge sound mirrors by Keith Allen. Geoff Mather has made some wonderful panoramic photos of the three Denge acoustic mirrors, as well as lots of other panoramic pictures. Michael Rich has a slideshow of photos of Denge taken in April 2009. Peter King photography’s Sound Mirrors Photos were taken on 13 July 2008, and Echoes In The Sky Dungeness & Sound Mirrors are from 19 August 2007. Dave Snowdon went on a guided walk to the sound mirrors of Lade Pit, Dungeness on 17 August 2008. There were, apparently, 261 people who attended this walk. The largest group in the 11 years Dr. Scarth has been giving these talks . He has some photos of the mirror and the crowds on his website.